£5.73 each & FREE Delivery in UK. These strips are made of Spring Steel. The main property of this is that it will ALWAYS RETURN TO A FLAT SHAPE. Other metals become bent and puckered so that you soon have a strip that prevents you having a smooth surface to work with. Being made of Spring Steel our strips ALWAYS SPRING BACK TO ORIGINAL SHAPE. 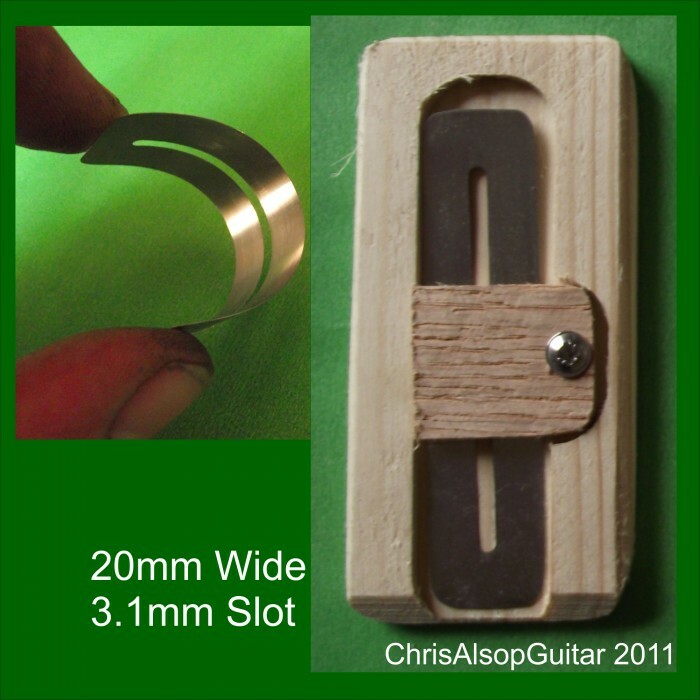 These strips are only 0.1mm thick , which is ultra thin for strips, so allows maximuim access to the frets. This dimension is very important as thicker strips restrict the amount of fret exposed for working on. 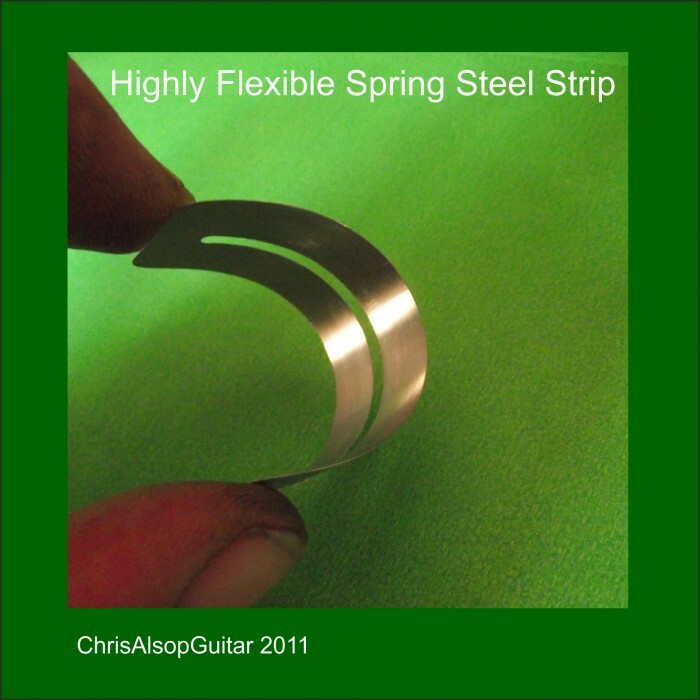 For example when working on a fret that has 1.0mm above the fretboard, then 0.25mm thick strips would only you to work on the top 75% of the fret. 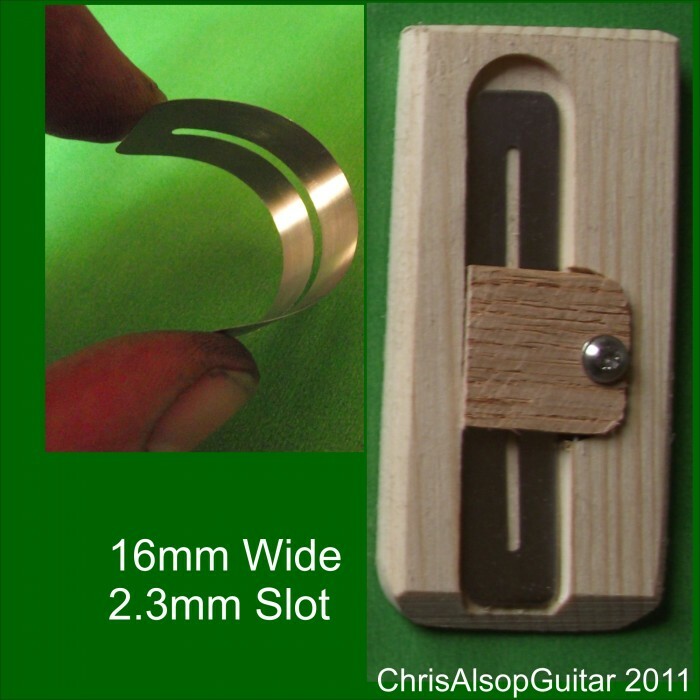 With our strips, on a 1.0mm fret, you will be able to access 90% of the fret height at any one time. 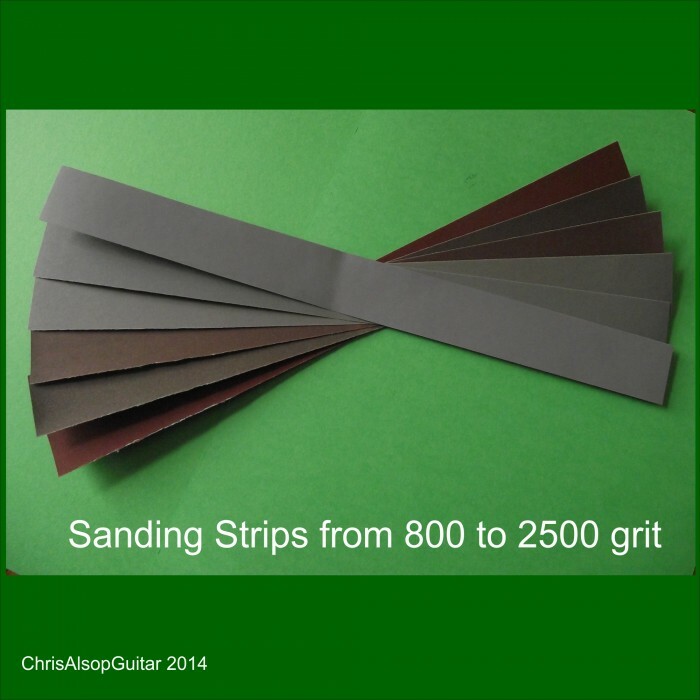 We include a set of sandpaper strips 800, 1000, 1200, 1500, 2000, 2500 grit. Each strip is approx 25mm by 280mm. These grits are used for crowning and polishing frets.
' 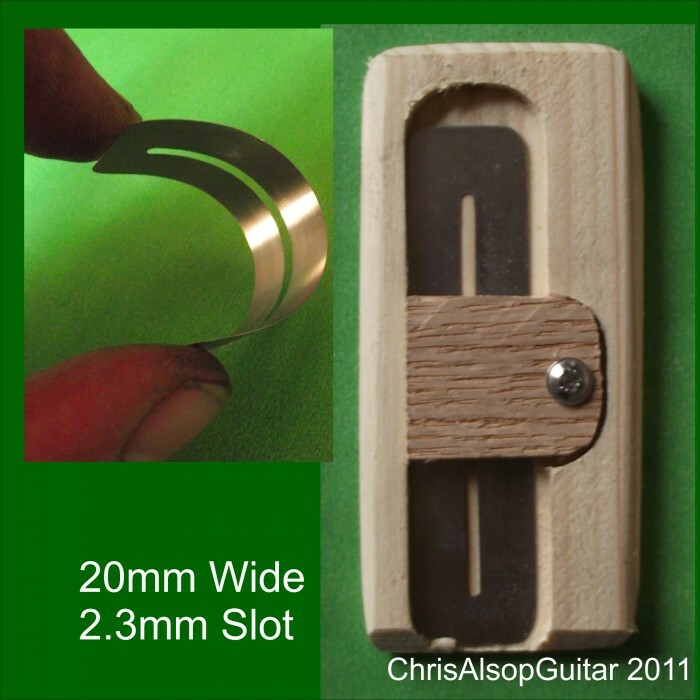 We have experimented with many different sheet materials for this tool, with the idea to have a thin strip (so you can get near to the bottom of the fret) which is tough and will not bend out of shape or wear out when subjected to abrasion. Our choice was hardened spring steel. The best property of this material is that it is virtually impossible to get dents and bumps bent into it . We tried many materials such a ordinary shim steel, brass etc. and they all start off flat but, after a bit of use, they tended to get a wrinkly and therefore would not sit nicely on the fretboard. With spring steel you can virtually bend it double and it will return to its original shape - making it always stay nice and smooth. 1. 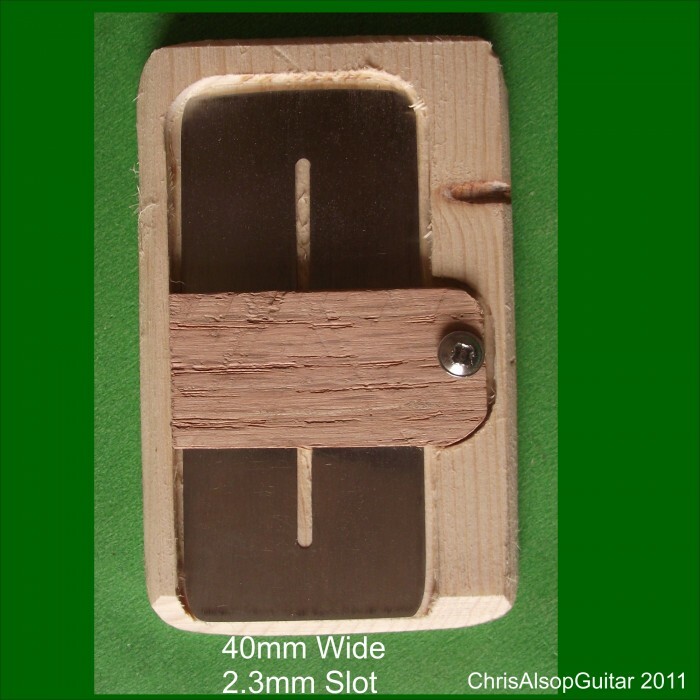 The width of the frets varies - some narrow (<2mm wide), some medium (about 2mm wide), some Jumbo (>2mm wide). 2. 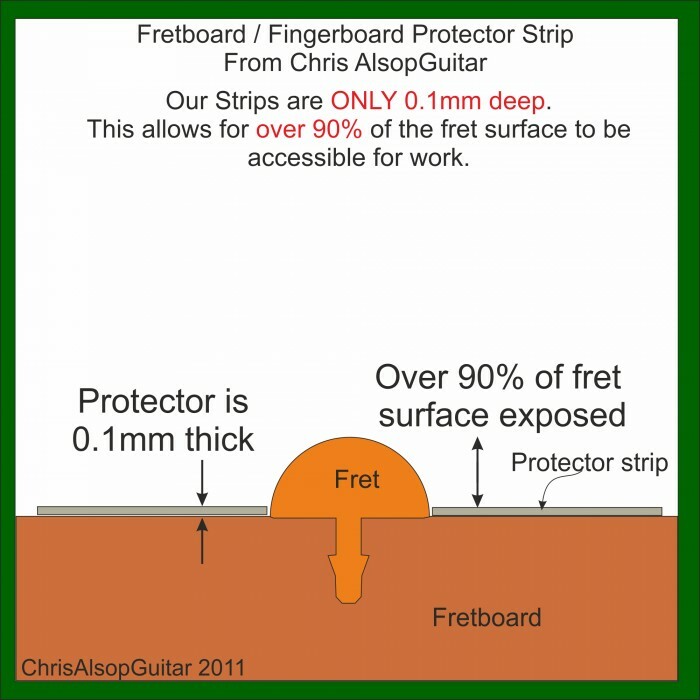 Obviously the width exposed fretboard wood - or the gap - between frets changes, as big as 36mm near the head of the guitar and as little as 8mm at the very highest frets. • A 20mm wide strip with a narrow slot. • A 20mm wide strip with a wide slot. • A 16mm wide strip with a narrow slot. • A 16mm wide strip with a wide slot. • A 40mm wide strip with a narrow slot. • A 40mm wide strip with a wide slot. This sale is for ONE of the strips. 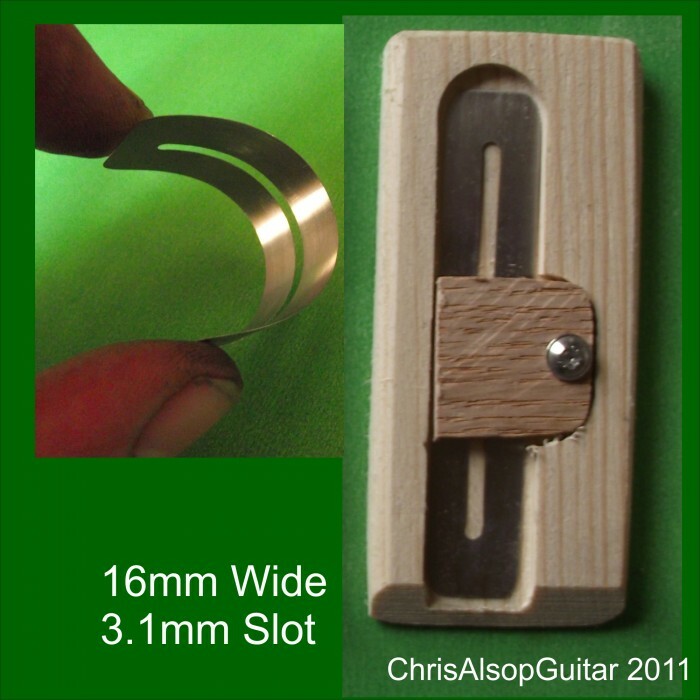 The 16mm size allows the very highest frets to be accomodated. 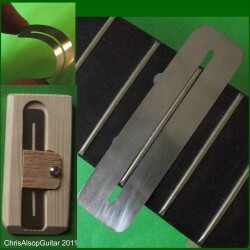 The 40mm will accomodate up to about the 17th fret. All strips supplied in protective wooden case. A printed guide to using these strips and refretting in general is included in this sale.